IMPORTANT!! BEFORE FILLING OUT THE FORM MAKE SURE TO CLICK WHERE IT SAYS "CLICK HERE" ON THE FORM. SEE PHOTO ABOVE. 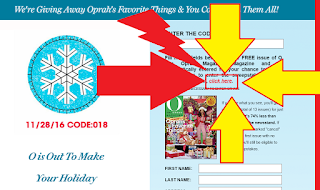 If you do not do that then you will be signed up for the Oprah Magazine subscription. READ STEP 1!!!! DO ENTER UNTIL YOU CLICK THE RIGHT PLACE ON THE PAGE FIRST!!! 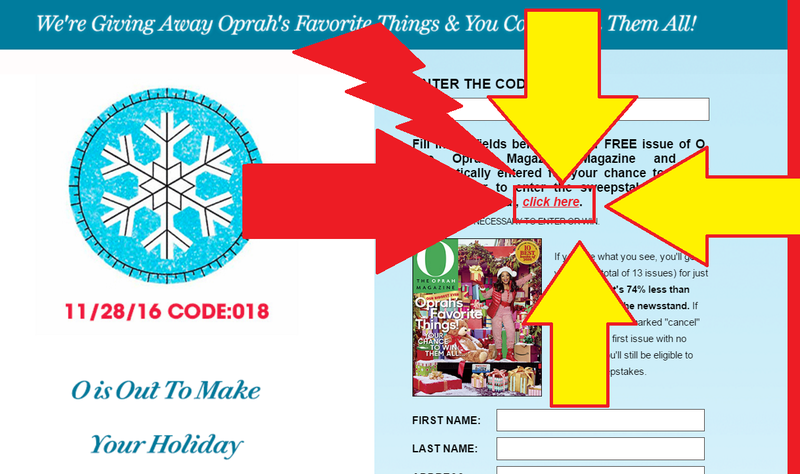 If you still made a mistake and signed up see here how to cancel. If you do not see your order right away, don't worry. It may take a day or two for the order to appear in your account. Once it is available, you will be able to cancel. 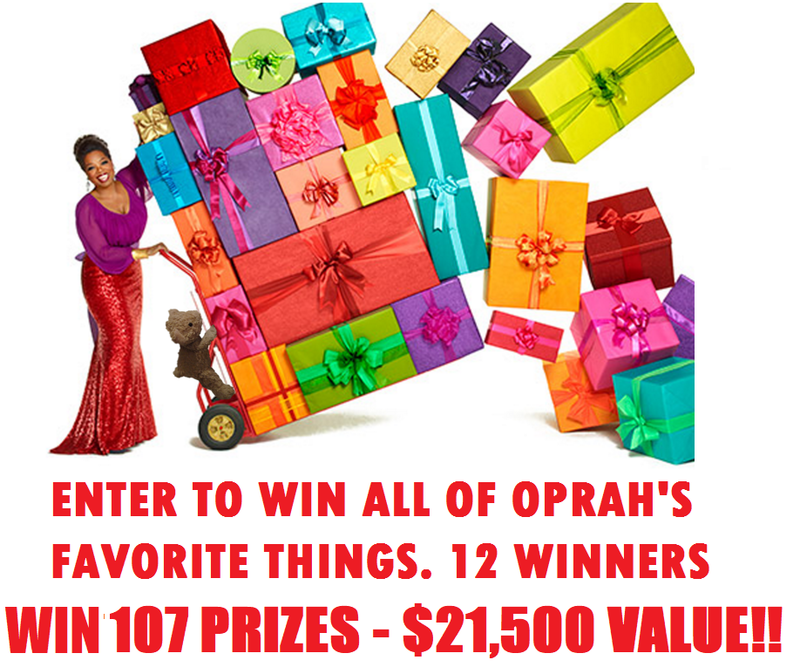 To see a list of this years 107 gifts click here to them all PRIZES & APPROXIMATE RETAIL VALUE (“ARV”): Twelve (12) Winners will each receive a prize package (collectively, the “Prize Package”) consisting of items chosen by Oprah, listed in the 2018 O List Favorite Things edition appearing in the December 2018 issue of O, The Oprah Magazine: Aarke sparkle water maker ($199.00), Black & Decker Helix Performance Premium Hand Mixer ($29.99), Yedi mug set ($49.99), Bindle Bottle water bottle ($39.00), Face to Face Designs two sets of napkins ($48.00 each, $96.00 total), Philips indoor grill ($329.95), Hurom AI Juicer ($699.00), Glitterville tumblers ($48.00), Cozy Earth Top Drawer Bamboo Bundle voucher (from $498.00), Nespresso Latissima One ($379.00), etúHOME small square serving board ($105.00), etúHOME medium square serving board ($125.00), Fleischer and Wolf knife block ($199.99), Chicago Metallic lasagna trio pan ($29.99), Izola straws ($20.00), Canvas Home small abbesses platter ($32.00), Canvas Home large abbesses platter ($42.00), Montes Doggett pitcher ($198.00), PF Candle Co five candles ($42.00 each, $210.00 total), Peace Love World blanket ($69.00), Pillow Bar mini travel pillow ($49.00), Rabbit Axis Lever Corkscrew ($49.95), Butter London nail lacquer collection ($160.00), Clarisonic face washer set ($356.00), Artis Elite 10 Brush Set ($360.00), La Chatelaine Deluxe 12 Hand Cream Tin ($68.00), Julep lip gloss collection ($149.00), Beekman soap set ($48.00), Library of Flowers three bottles of bubble bath ($36.00 each, $108.00 total), Lollia body oil and body butter set ($65.00), Foot Nanny pedicure set ($60.00), Sunday Riley set ($140.00), The Regal Wrap by Kim Hawthorne head wrap ($62.00), Embark dog DNA test ($199.00), Pretty Rugged blanket voucher ($140.00), Harry Barker grooming set voucher ($62.00), Magaschoni sweater voucher ($198.00), LA Relaxed jumpsuit voucher ($168.00), Burt’s Bees five pairs of pajamas voucher (from $12.95 each, from $64.75 total), Echo faux fur vest voucher ($89.00), Softies Comfort Wear lounger voucher ($95.00), Barefoot Dreams caftan ($134.00), Kassatex robe voucher ($110.00), Land’s End coat voucher (from $219.00), Talbots pants voucher (from $89.50), Eberjay Core Gisele Pajamas voucher ($120.00), Chico’s top voucher ($99.00), Tory Sport track jacket ($165.00), Tory Sport track pants ($135.00), Core 10 jacket voucher ($65.00), Athletic Propulsion Labs sneaker voucher ($200.00), Un Billion tote bag ($89.99), Peepers one pair of sunglasses ($24.00), Peepers one pair of readers ($25.00), Paravel bag ($60.00), PurseN Littbag ($42.00), Pudus one pair of socks (From $16.00), K-Carroll crossbody bag ($19.99), Travaux En Cours fedora ($110.00), Glamourpuss NYC faux fur mittens ($78.00), Vionic slippers voucher ($79.95), Baekgaard Clark Backpack ($158.00), Baekgaard Clark Duffel ($178.00), House of Fluff scarf ($125.00), Renee’s Accessories gloves ($144.00), Janis by Janis Savitt earrings ($99.00), Maya J Jewelry bracelet ($38.00), Burgon and Ball gardening set ($99.00), Urban Agriculture grow kit ($45.00), Chronicle Books Letters for a Year of Gratitude ($19.95), Olli Ella Suitcase ($79.00), Kid Made Modern craft kit ($39.99), Cece Dupraz custom boat tote ($94.00), Areaware gradient puzzle ($20.00), Three by Three jOTBLOCK Watercolor Set ($30.00), Love Bubby t-shirt ($28.00), Love Bubby onesie ($26.00), Jeanne Simmons hat ($23.99), Menus Jacques Pepin Menus ($19.99), Eccolo two journals ($24.00 each, $48.00 total), TruMedic IS-4000 InstaShiatsu Foot Massager ($199.00), Katana Arc ($99.00), Lumos helmet ($179.99), Aura digital photo frame ($299.00), Courant charging pad ($175.00), RapidX X5Charger 5 Port ($24.99), Samsung 55” Q7FN QLED TV voucher ($1,299.99), Ricoh Theta SC 360° camera ($199.95), Apple Watch Series 4, 40mm band ($799.00), Apple Air Pods ($159.00), Apple Phone XR ($749.00), Story Bicycles Electric Bike voucher ($1,695.00), Amazon Spot ($129.99), Truff hot sauce ($14.99), Urbani truffle burger kit voucher ($62.00), Kate Weiser Chocolate Carl voucher ($38.00), Sabatino pasta set ($49.95), Chelsea Market Basket chip and pipcorn truffle set ($79.00), **Casa Dragones 375ml Tequila voucher ($42.00), Vahdam Tea Chia Trio Set ($29.99), From Roy Panettone voucher ($49.99), Russ and Daughters New York Brunch Set voucher ($140.00), Bella Cucina Party in a Basket ($150.00), Josephine’s Feast jam set ($159.00), Eli’s Cheesecakes Holiday Cheesecake Dippers voucher ($35.95), Popinsanity 6.5 gallon tin voucher ($179.95), We Take The Cake two bundt cakes voucher ($36.00 each, $72.00 total), Lee Lee Rugelach chocolate rugelach voucher ($18.00), Lee Lee Rugelach apricot rugelach voucher ($18.00), Hilliards Chocolate Hanukkah bark voucher ($29.95), Hilliards Chocolate peppermint bark voucher ($29.95), Martin’s BBQ Joint sauce set ($49.95), Mount Mansfield syrup ($35.00), Little Belgians Saint Nick cookie set ($19.00), Hancock Gourmet Lobster truffle and lobster mac & cheese voucher ($62.00).